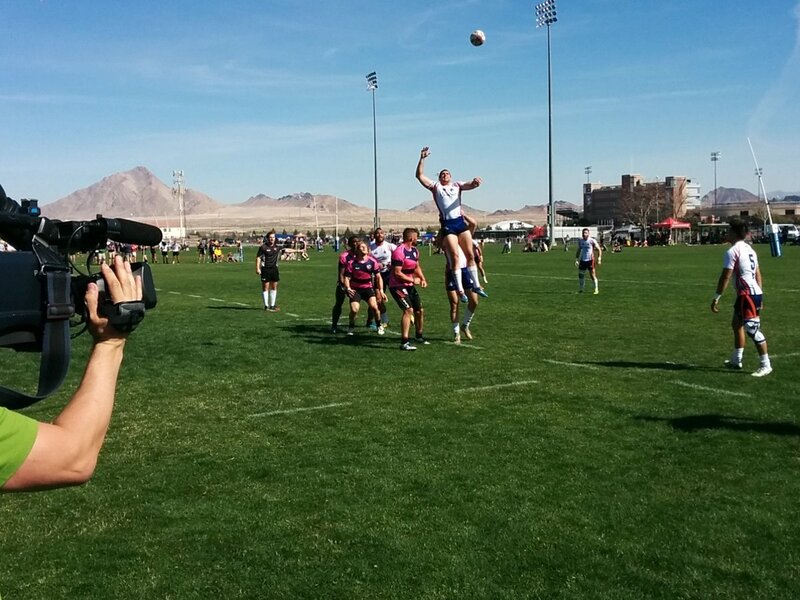 The semi-finals of the Men’s Elite bracket at the LVI are set. The Falcons, Daveta, Froggies, and Germany all advanced to tomorrow’s action. Of those four teams Daveta looked good as did Germany and the Falcons although each had to work for it. Through one half it appeared that the Falcons were going to cruise through their match against the Northeast Academy. The Falcons fielded a number of players that have appeared on the Series and that paid off early. Thretton Palamo made the early initial break before being caught. The Falcons worked it through a couple of phases until it fell into the hands of Pat Blair who leaped over the defense for the try and a 5-0 lead. A yellow card to the Northeast Academy gave the Falcons a numbers advantage that they would use to push Pete Tiberio over. An additional try from Spike David gave the Falcons a 17-0 lead at halftime and it looked like they were going to cruise. No one told the Northeast Academy that. Catching the U.S. defense out at times the speedy Rick Kirkland found the gap around the corner for the try. That gave the Northeast Academy momentum and a few minutes later Derek Lipscomb slipped through tackles to put the score at 17-12. The Northeast Academy continued to press as the match wore on. On a couple of occasions they nearly scored but the Falcons defense held. The match was only finally settled when a chip from Pono Haitsuka was recovered by the well-placed Tiberio. The ball was fed to Jope Motokana who then found the supporting Seth Halliman for the score. The Falcons will play Daveta in the semi-finals, a team that dominated their opponents France Develoment 33-19. Germany showed how clinical they were in a 31-7 win over Denver. Germany aren’t a flashy side but they punished Denver mistakes and frustrated them on offense as well. The Froggies Midol benefited from two yellow cards to Chile at the end of the first half to win 26-21. The Northeast Academy and France Development and Chile and Denver will play their final matches of the tournament this afternoon in the consolation round.